Beans are packed with fiber, protein, vitamins and minerals with no saturated or trans fat. When dried, heart-healthy legumes are a convenience item for long-term storage in your pantry. Cooking them is simple and relatively hands-off, requiring little more than an initial soak and occasional stirring; even unpracticed home cooks can successfully cook dried beans. Cooking them in the microwave cuts the cooking time in half. Just remember to cover them, or they'll end up hard and inedible. Put the desired quantity of dried beans into a colander, keeping in mind they bulk up about 50 percent after cooking. Sort through them carefully, removing shriveled or discolored pieces and any foreign matter. Rinse them under cold running water. Transfer the beans to a casserole dish or other large microwave-safe vessel with a tight-fitting lid. Use a dish with at least twice the volume of beans and added water to prevent overflow during cooking. 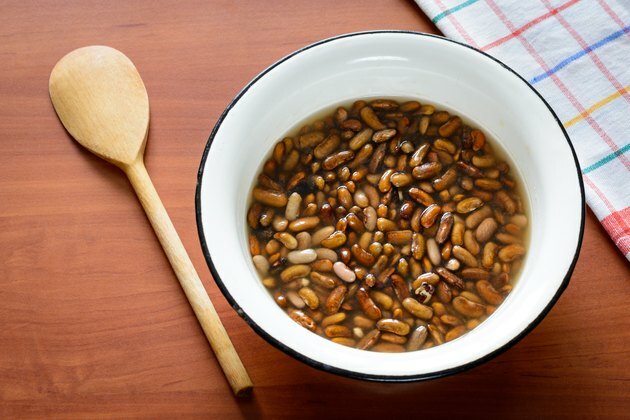 Add 1 quart of water per pound of dried beans and soak them in the refrigerator for 6 to 12 hours. In general, the larger the beans, the longer you should soak them, and the longer the soak, the shorter the cooking time. Add salt and pepper; herbs and spices to taste, such as sage, rosemary and thyme; garlic and onions; bacon or bacon drippings; ham; olive oil or other desired flavoring agents into the dish. Put the lid on the casserole dish; put it into the microwave. Microwave the beans on high power for 7 to 10 minutes, until the water is boiling. Remove the casserole dish and thoroughly stir the beans with a cooking spoon. Replace the lid and return the dish to the microwave. Reduce the microwave power level to 50 percent and cook the beans for 15 minutes longer. Stir and test for tenderness. Continue cooking as necessary for up to about 40 minutes longer. Stir and check the beans every 15 minutes. Cooking time varies considerably depending on the type of bean and duration of the initial soak. Let the beans stand for 5 minutes with the lid still on the casserole dish, then drain them. Add other seasonings as desired. The liquid from the beans can serve as a stock for soups and stews. Some cooks add salt after the beans are cooked to reduce the risk of tough beans.